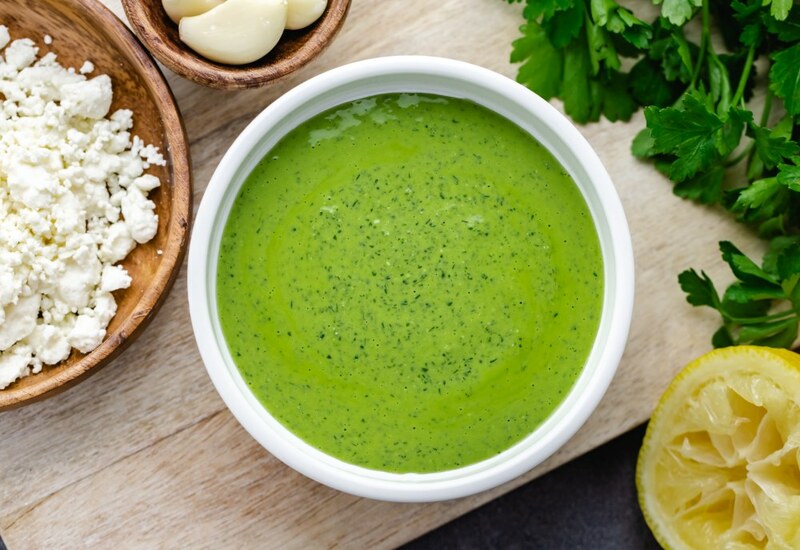 This green goddess dressing is so vibrantly green thanks to all the fresh herbs (parsley, mint, and dill). The immersion blender makes this a creamy and smooth dressing that goes well on salad or as a dipping sauce. It only takes about 10 minutes to make, so it is great for a quick weeknight dressing or a casual get-together. Skip the feta cheese and yogurt for a vegan version. If you don't like one of the herbs (parsley, mint, or dill) you can eliminate one. Per Serving: 74 calories; 7g fat; 1.8g carbohydrates; 1g protein; 2mg cholesterol; 161mg sodium.